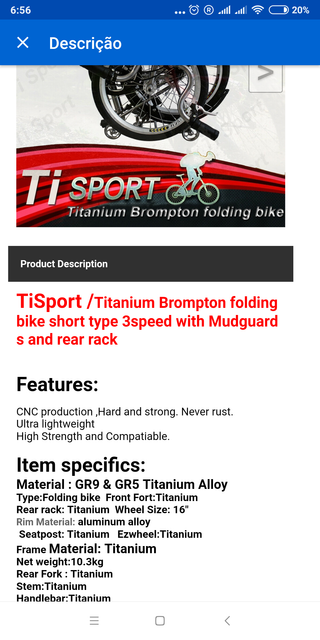 Titanium Brompton frames (both UK and third party ones) are claimed to be made of grade 9 titanium alloy (Ti-3Al-2.5V) Brompton said their frames are made of hi-tensile steel. Let's assme it is AISI 4340 steel alloy. As ti alloy is roughly 1.74x lighter than steel alloy. if one directly copy steel frame (~2000gr) with titanium it will only weigh 1150gr. Mine is roughly 10% heavier than that, which means it uses slightly thicker tubing than steel ones. - Yield Strength: how much force can a material withstand before permanent deformation. Or how unlikely the frame will snap under pressure. 4340 steel has yield strength of 470MPa, and grade 9 titanium alloy has yield strength of 724MPa. As they are measured by volume, I can say that grade 9 titanium frame is 724/470=1.54 times stronger if built identically. And as my frame has 1.1x more material, it will be 1.54*1.1 = 1.7x stronger than original frame. -Modulus of Elasticity: how much does a material undergo elastic deformation under a small load. Or how springly/supple will it be. 4340 steel has MoE of 27~30M psi. Grade 9 ti alloy has 15~17M psi. So titanium is roughly twice more flexy if built identically (same volume, 1.7x lower weight). tl;dr The titanium parts will be 1.5x stronger, 1.7x lighter but 2x supple compared to steel parts of EQUAL thickness. amazing feat in archiving those wheight. even they factory cannot sell bikes that light. they are selling full brompton copycat now too with grade 9 and grade 5 titanium aloy internal hub derrailer(srf3), rack(titanium) and mudguards(plastic). Last edited by BromptonINrio; 02-02-19 at 03:16 AM.